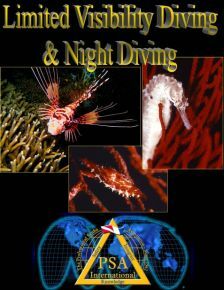 The PSAI Night Diving Specialty course is designed to train divers in the benefits, equipment required, and proper procedures for diving after sunset or at night. Selecting a Site for Night Diving. If you are only accustomed to diving when it is daylight, your next logical exploit is to go on a night dive. Everything dramatically changes at night in the underwater world. Any uncertainties that you may have about night diving will promptly dissolve when you enter the seemingly magical world that exists underwater after dark. You may have experienced from land the wonders of a star filled night. The sensations are even more commanding for those who choose to venture underwater at dark. Colors are much more intense. Your light seems to hold almost a mystical power by transforming a dark world into a wonderland full of fascinating objects, many with brilliant hues. Not only will you notice the colors, you will find at many dive sites a whole new set of actors. The nocturnal marine life will become active and emerge from their daytime hiding places. Once you make your first night dive, you will be looking forward to your next opportunity to visit the exciting and captivating realm that only the night diving can provide underwater.